Why biweekly is usually cheaper. The best of all payment frequencies. Enter the amount you are looking to borrow, without the dollar sign or commas. This is otherwise referred to as Principal. Enter the interest rate of the loan expressed as a percentage, but without the percent sign (for 6.5%, enter 6.5). Enter the number of years you would like to spread your biweekly payments over. The longer you take to pay back the loan, the more of your hard earned money will go toward paying interest charges to the lender. Select the month, day, and year you plan to make your first biweekly payment. The calculator will use this date to create a 1st year payment schedule. Select your preference for including an amortization schedule in the results: None, Yr 1 only, or Full. Based on your entries, this is how much your biweekly payment will be for the duration of the loan repayment. This is the number of years multiplied by 26 (the number of two-week periods per year). This the combined total of all of your biweekly payments from your first to last payment (# of years X 26 X payment amount). This is the same as the loan amount you entered in the top section of the calculator. This how much you will end up paying in interest charges to your lender from your first to last payment. This is the estmated date of the final bi-weekly payment. This calculator will calculate the payment amount and total interest charges for a biweekly loan, and then present you with the first year payment schedule. Plus, the calculator will also help you to compare the payments and interest charges to other payment frequencies (monthly, bi-monthly, quarterly, semi-annually, and annually). Note that if you have an existing loan that you are making monthly payments on and you would like to see how much you could save by switching to a biweekly payment method (making 26 half-payments per year), please visit the Biweekly Loan Payment Calculator. Enter the amount you are looking to borrow (principal). Enter the annual interest rate of the biweekly loan. Select the month, day, and year of the date of the first payment. 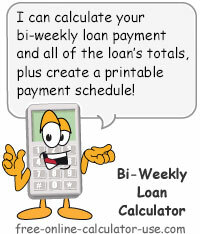 Click the "Calculate Bi-Weekly Loan" button. Why biweekly is cheaper, but not the cheapest. Given the same repayment time-frame and loan interest rate, choosing a bi-weekly loan over other popular loan repayment frequencies will usually result in the lowest interest cost. That's because the balance that the interest is charged on is declining more often. To understand why increasing loan repayment frequencies reduces interest costs -- all other terms being equal, think of a loan as the lender renting the use of each dollar bill they borrow to you. This means that the sooner you return a dollar bill you are renting, the less rent you will be charged on that dollar. For example, if you are making annual payments, then you will be renting the same number of dollars during the entire year -- giving the lending institutions more time to charge you rent on each dollar. On the other hand, if you return a portion of the rented dollars periodically throughout the year, the rent you will be charged will be less than the rent charged on the annual payment frequency. And the faster you return the dollars, the lower your annual rental charges will be. In other words, if you save up and pay cash for the item you are considering purchasing you will only end up making one payment and you will end up paying $0.00 in interest charges. In my opinion, if you don't want a non-essential product bad enough to save up and pay cash for it, you don't want it bad enough to be purchasing it in the first place.